Hey there. I know that Plants Vs. Zombies has been around for some time. I even gave away of the Xbox 360 version to a winner sometime last year. Yet, I never actually played the game myself. That is, until now. I recently saw the Plants Vs. Zombies Kindle Fire Edition on sale and I had to jump on it. With so many positive reviews and friends everywhere saying that I should try it, I finally jumped on board. And guess what, it's pretty awesome! I'm glad that I managed to snag it at an awesome price! The kids and I love it and even my 2 year old has gotten into the action. He doesn't know how to play the game but he asks to see the zombies and will gladly sit and watch someone else play. lol Here is my review of Plants Vs. Zombies the Kindle Fire Edition. It was great to be able to play the game on a big screen. 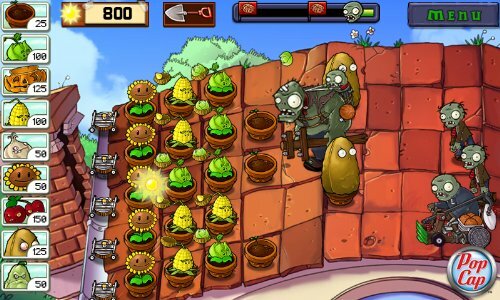 Plants Vs. Zombies started off as an Android smart phone game and despite the smaller screen, the game managed to fit as much action as possible on it. And trust me, there is a lot of action going on. The premise of the game is simple: Keep the zombies out of your house. 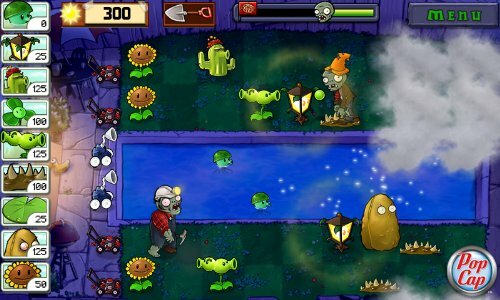 By using your plants as a zombie fighting army, you slow, repel, and destroy zombies. There are many plants to unlock and some strategy will come into play once you realize that you cannot have all of your plants at your disposal. Anything from hot chili peppers to pea shooting plants, there is a wide array of attacking plants, trap plants, and plants that enhance security, visibility, and fire power. With only a few slots available at the beginning of the game, you soon come to the realization that the more options you have, the better you are off against the zombie hordes. Ahhhhh!!! Zombies in my pool!!!! And the zombies... lol... I love that this is not a run of the mill, mindless zombie game. The zombies varies in degree of toughness and speed and if you are caught with out properly preparing for them, they will get to your house. The "disco zombie" and the the "zombie on a dolphin" are some of the kids' favorites. The disco zombie summons 4 zombies to surround it as it dances it's way towards your house the "zombie on the dolphin" speeds through the water as the "Flipper sound" plays. It's a great way to blend a little humor into the game. Then there is Crazy Dave. As you progress through the game, Crazy Dave presents himself as a babbling man that makes absolutely no sense (thank goodness for the talk bubbles. lol) and he's more of shop owner than anything else. You can purchase plant and defense enhancements from him and provides more of that zombie humor that the kids love. Ahhhh!!! Zombies be on my roof! As for the game play itself, it's pretty simple. You use sun to plant your plants. During the day, sun falls from the sky that you can easily tap to collect. You can also plant sunflowers to provide you with additional sun and trust me, you'll be wise to have plenty of sunflowers planted. During nighttime levels, there is no sun out so you don't get that additional sun falling from the sky so planting those sunflowers are more important. The nighttime levels tend to be more challenging so these are my personal favorite. Once you have enough sun to plant flowers, you simply tap the flower and tap the space you want to plant it in. Once that's done, you hope your strategy works. That really is all to it. You plant on the left and the zombies creep up from the right. The big screen makes it very simple to select the correct spot to plant. That's one of the advantages of playing it on a Kindle Fire. That and... it's in glorious HD!!! There are also a few minigames that are mandatory levels. The "whack a zombie" is a fun one and the young ones the "bowling for zombies" level. These can also be frantic since you cannot select the plants yourself. The available plant rolls up on a conveyor belt type thing and you need to work with what you are given. This adds a different twist than what you have been doing up until the minigame comes up. All in all, I love the game. It's great that they finally released a Kindle Fire Edition version since it's better to play and watch it on a 7 inch screen as opposed to a 3 to 4 inch screen. The colors are vibrant and the sound is crisp and you can save at least 3 games. I haven't tried saving any more but I wouldn't doubt it if 3 is the max. If you haven't tried out Plants Vs. Zombies, you are definitely missing out on a great game! 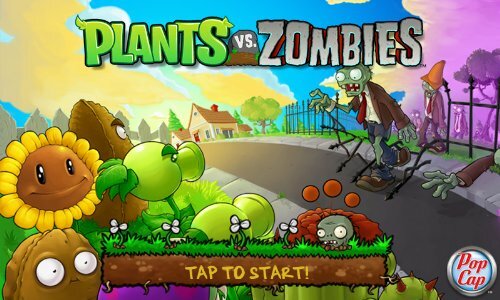 You can get the Plants Vs. Zombie game for your Kindle Fire or other Android device on Amazon by using the link below! Later! This looks fun. I think it was popular because I have heard of spin-offs. I wish I had a tablet or smartphone with which to use this! Hey there Betty! Plants Vs Zombies is insanely fun! I couldn't put it down when I first got it and once I got through the game, I had to go back and collect some of the achievements that I missed! It's definitely worth it to buy it!